When in 2008 for the first time we came to Nida , we dubiously entered the only tavern located on this plateau. A large building, which is difficult to call a finite one, did not give a very optimistic impression. Above the windows, someone using the oil paint smeared the word TABEPNA. It looked a little professional and looked like an abandoned building. In the middle, with no clear order, there were set up modest tables and chairs that looked like furniture taken from the Polish PRL alive. At one of them sat some local shepherds who greeted us with their stern eyes. We felt like two intruders entering foreign territory. Without looking too much, we turned around and went on a trip to the cave of Idi . A few years of holiday in Greece has changed our views on this type of places, and the sight has sharpened on catching small details that guarantee a tasty meal. This year, we went to Nida again and again went inside this tavern. Unhurried service and a very short menu, which was chalked on a small blackboard, encouraged us to stay inside. A view of a group of shepherds finishing their meal, who licked their fingers without much embarrassment, this time did not discourage us. After placing the order, our table was covered with a paper cloth, on which in a moment appeared two tall glasses filled with a strong frappe. Sipping coffee, we admired the Nida Plateau , whose green surface was traversed by several herds of sheep. At that time, the sounds of bustle in the kitchen began to come to our ears ... a melody announcing a fresh, almost home-cooked meal. After a while, we received equally tasty aromas. After a few more minutes, we could enjoy the best Dakos we ate during this holiday. However, their taste came to the background and lost their splendor when we tried the small Kalitsounia dumplings, which were poured with honey mixed with cinnamon. There was a cheese filling full of herbal aromas under the golden crunchy skin. Already after one bite on our lips came a wide smile. It was definitely one of the better dishes we ate in Greece. From that day during this year's stay, every subsequent dish that we ate at other taverns was in the opinion ... good, but the dumplings on Nida were better. At the end, we have a rustic salad, which, according to Cretan culinary art, was prepared without much attention to detail. On sloppy and thickly chopped vegetables, a slice of feta sprinkled with fine olives. In such a simple dish completely devoid of finesse, it is difficult to look for beauty or some artistry. We can, however, assure you that the taste values ​​are inversely proportional to the appearance. Without exaggeration, we will write that the feta and olives on the top of the vegetable pyramid were some of the best we have ever been able to eat. With a depleted budget of about 10 € and belly full of amazing flavors, we could go on our further journey. If in your plans there is a plateau Nida and Idi, you must also add a stopover and a meal in this modest Tavern. Apart from the disadvantages of this place, you will find here cheap and very tasty food. The profession of this 82-year-old Cretan is slowly falling into oblivion and his role is taken over by production lines in factories. Giorgos Chatziparaschos is one of the last producers of confectionery created on the basis of the hand-made filo pastry and its small plant can be visited in Rethymno, for which we strongly urge you. If anyone of you is looking for a good restaurant near Matala and Kalamaki, then we would like to recommend estiório Chrisopigi. Delicious Greek dishes served in an unusual way surrounded by a well-tended garden are the perfect end to the day. We recommend! 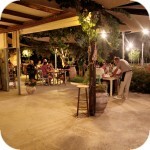 The Hydria pottery workshop in Asomatos is one of those special places where you can still see the Cretan craft. Stavros Kallonakis is handed out by unique ceramics with high quality and interesting patterns. We recommend!